On October 7th we donated 20 NICU care packages, 20 angel memory boxes, 26 baby blankets, 19 burial gowns, 24 preemie clothes, and a book for the NICU library to St. Mary’s Hospital. This was our second donation to the hospital, and makes our total donations to St. Mary’s 32 angel memory boxes, 40 NICU care packages, 67 books, 50 baby blankets, 24 preemie clothes and 47 gowns with matching booties and hats! When we started Mikayla’s Grace we never imagined the impact we’d be able to have on this community of parents. October 15th marked the first event, The Forever in Our Hearts Remembrance Day, in the Madison area to honorthe official day of Pregnancy and Infant Loss Remembrance. 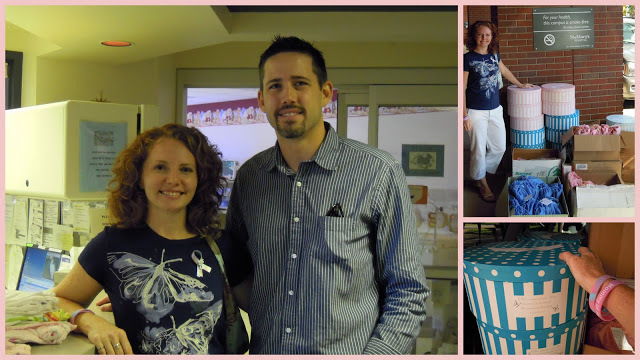 Mikayla’s Grace was honored to be part of this event to support all families who have experienced the loss of their child(ren) through pregnancy, stillbirth, or in early infancy along with families and friends of those parents. There were over 150 people at the event and another 15 famiies that chose to “Walk in Spirit.” The Forever in Our Hearts Remembrance Day was the inspiration of Alissa Paulson-Cedars in memory of her daughter Kennedy Kate that who died in October 2009. You can read more about how Alissa and I met and started working on this event here. It was a chilly, and very windy, fall day but the sun was shining and it was a beautiful day to honor the brief lives of our children. Please see below for all of the names read at the event that day. It is always heartbreaking to know that so many families have been touched by the loss of a child, but we are so thankful that no one has to feel alone in this type of loss. 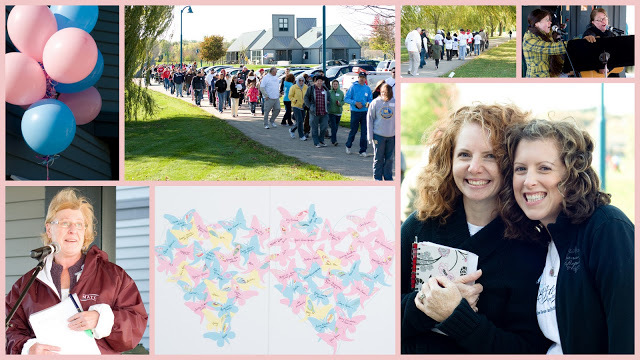 The event kicked off with an inspirational speaker, Linda Colletti who is a fellow babyloss mom, beautiful music by Terry and Jessica Helgestad, followed by reading of the babies names, a memorial walk around the park, and a dove release and bubbles to heaven. You can see more pictures here and here on our Facebook page. We raised close to $1500 the day of the event from the silent auction that will go to help more families in local hospitals and towards next year’s event. We have already set a tenative date for Saturday, October 13th, 2012. We will be looking for help in planning the event next year and if you are interested please email mikaylasgrace@gmail.com. On October 21st, we got the official word that Mikayla’s Grace is the recipient of a $5000 Pepsi Refresh Grant. Thank you, thank you, thank you to those of you who helped vote for us, without the votes of our supporters we wouldn’t have had this opportunity. The last week of voting we received hundreds of power votes from a Girl Scout troop in New York who found Pepsi power vote caps while collecting recycling at their local ball parks. They went to the website and chose a project to give all the votes to. With the help of these girls and all of our supporters we finished #6 in our category. We should receive the first disbursement of the grant money in November and will be using this to provide another 60 angel memory boxes and 40-60 NICU care packages. Our first goal is to expand our donations to Meriter Hospital and we have a meeting set up with them in November to determne their needs. We are hoping to take a few months off for the holidays and host a HUGE work day in the spring and then make the donations to both St. Mary’s and Meriter Hospital by May. The grant money has be be completely used by July of 2012, so we are going to be looking for some volunteers to help us complete this project. If you are able to help us plan the spring work day and organize the donations we would GREATLY appreciate your help. If you are interested, email me at mikaylasgrace@gmail.com and we can discuss details. If you are still looking for something fun to do with your kids to celebrate Halloween this weekend, this Spooktacular Harvest Party is a free event hosted by Danielle Bradley of First Moments Photography. Danielle was Mikayla’s photographer for Now I Lay Me Down to Sleep and does so much to help bereaved parents in our community by being one of the NILMDTS area coordinators. The event sounds like a TON of fun and for a donation to Mikayla’s Grace you’ll get a digital image of your child(ren) all dressed up in their costumes! There is a way that everyone can support bereaved parents by signing this petition to support the Parental Bereavement Act of 2011 (S 1358). This amendment to the FMLA will expand coverage and existing benefits to employees that have experienced the death of a child. Currently parents are not covered for FMLA leave for the death of a child, which is one of the worst experiences that anyone can endure. I find it unacceptable that the death of a child is not included as a protected reason to qualify for the benefits that are set forth in the Family Medical Leave Act and I hope that you will take a moment to sign this petition to make the necessary modifications to FMLA benefits. Well, March has been another busy month for us with Mikayla’s Grace. We have over 150 followers on our facebook page and have raised almost $800 in our Flower Fundraiser!! If you haven’t purchased your flowers yet, you can still do that until April 29th! Flowers will start shipping in late April. Please help us spread the word about this fundraiser by sharing the link with your family/friends or on your facebook page. 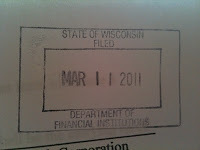 As of March 11th, we are officially registered as a nonstock corporation for the State of WI, which is the first step towards registering as a 501(c)3 non profit with the IRS. We sent in our Articles of Incorporation and have created our bylaws and elected our board officers. We have completed most of the IRS paperwork (30 pages! ), and hope to have that sent in by next week. If the IRS accepts our registration, any donations made after March 11, 2011 will be tax deductible for our donors. We are eternally grateful for our friend, Rebecca Markert, who is volunteering her time and expertise of the law to help us complete this process. I’ve spoken with other families who have started similar non profits who have taken a year or more to complete this process and spent much more money. We’ll still have several months to hear from the IRS, but getting the paperwork completed is a big step! 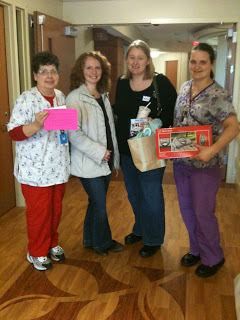 We were able to visit the hospital to drop off the donation of the CD player for the Family Care Suites. Claire, the mommy of James and Sophia, was able to be present with me for the donation. We happened to be there at a shift change and there were quite a few nurses present in the conference room who cared for Claire while she was on hospital bedrest with her son Isaac who was born recently. I was able to tell them about our story and how we got started with Mikayla’s Grace, and Claire was able to give the nurses an update on Isaac too. It made me so excited about our upcoming donation in June for Mikayla’s birthday. I also had a wonderful meeting with two nurses from St. Mary’s Hospital, Chantel Schneeburg and Laura Ziebarth. 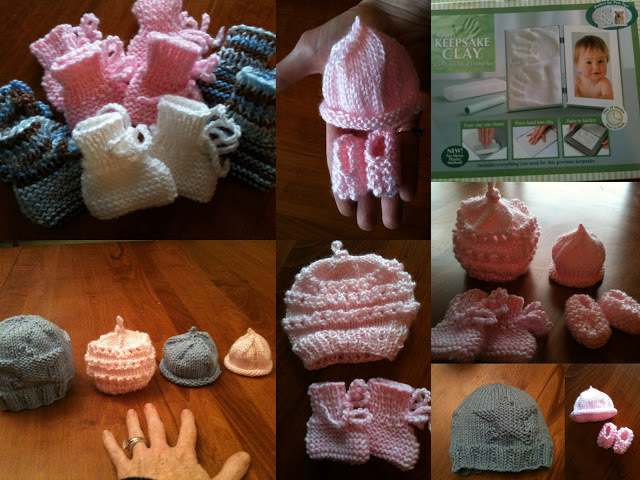 We discussed ideas for both the NICU care packages and the Angel Memory boxes. They are excited about our plan and were able to offer a bit of guidance for some of the logistics of getting the boxes donated. We also discussed ways that the items we are donating can be used to help families have a more positive experience in the hospital. I was able to give them some feedback from our experience when Mikayla was in the hospital. While St. Mary’s does have money in the budget to purchase small memory boxes, like the one we received, St. Mary’s currently does not have a group who donates memory boxes. I’ve had several people ask me why we are doing these donations, because they assumed that this is something the hospital would automatically provide for parents. Unfortunately, that is not the case. We hope that through our donations to be able to make sure that every parent who leaves the hospital without their baby has at least had the opportunity to make the most of that short time in the hospital. We hope to ensure they will come away with memories of their baby and items that they will be able to cherish to remember their babies. St. Mary’s does have a volunteer group that donates knitted hats and blankets on a regular basis, but there are many things we are going to include in our donations that they do not receive currently. We will be focusing a little more on the items that the hospital does not receive donations for currently after our first donation. 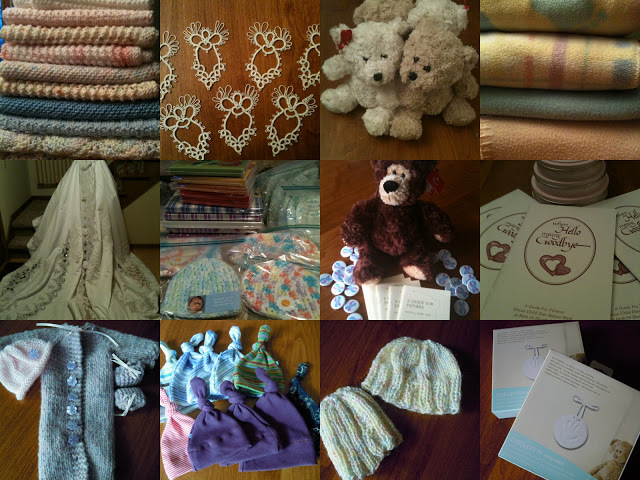 There are certain items that we will need more volunteers to help us make, especially the knit/crochet and sewn gowns. I am working on a post (hopefully within the next few weeks) with some of the patterns I’ve been using and some ideas for the gowns. You’ll see a wedding dress (pics below) that a friend donated so that we can use the material to make gowns, and I’ll have more information about that soon too! If you know how to knit, crochet or sew and would be interested in making some of these gowns please email me at mikaylasgrace@gmail.com. I wrote a guest blog post called Do Not Be Afraid of Their Tears that gives advice on how you can be supportive to bereaved parents. I’m hoping to have a resource area on this site eventually. This month we received many donations and you can see an updated list of our supporters on this page. Here are some pictures. There are still other items we will need to purchase once we get our fundraising money in May, like the cameras and hand/feet casting molds. Once again, thank you all for your support. Without our volunteers and your generous donations, none of this would be possible! Somewhere on this planet, someone has a solution to each of the world’s problems. It might be one of us. With your help, we can build a more hopeful world.